"I am so glad that we chose OGL to work with. Without doubt I will have no hesitation in recommending OGL to colleagues and other peers I come into contact with." At OGL, we understand that moving to a new IT provider is a big change so we put an awful lot of effort into ensuring our customers are extremely well looked after during the switch to OGL, and beyond. Our partnerships with world leading brands such as HP, Microsoft, Citrix, VMware and Kaspersky mean we get access to exclusive technical information, training, user groups, member websites, pre-release products and evaluation packages. In turn this means the services we deliver to you are best-in-class, and more importantly will result in hassle-free IT for you. The beauty of choosing OGL as your IT partner is that we have hundreds of IT professionals at our disposal, meaning we have every kind of IT specialism covered. That means you don’t have the task of finding your own IT staff. Of course, some of our customers like to have their own internal IT resource in which case we are more than happy to work alongside them. Our team of experts will be on hand throughout your move to ensure you receive a first class OGL introduction and migration from your previous IT provider. The team is very familiar with the extra requirements that our new customers naturally have and are well equipped to handle all enquiries and ensure you are confident with your move to OGL. If you have purchased a full IT hardware or hosted solution, you will be assigned a dedicated Project Manager who will draw up a scope of works for you to approve. This document will include key milestones to ensure the project is running smoothly. IT hardware unavoidably needs repairs, fixes, and patching from time to time. Our experienced engineers operate from a state-of-the-art IT workshop to test, diagnose and repair hardware. We also offer a loan equipment service whereby we will deliver and install replacement kit, whilst yours is in our workshop. We’re always thinking of our customers and how to minimise disruption and downtime. What happens once you’ve successfully transitioned to OGL Computer? After your transition period, we will introduce you to your dedicated Account Manager who will work with you to ensure that your IT infrastructure and services are meeting the needs of your business. They’ll also offer ongoing service reviews, advice and guidance. IT and the provision for business technology is now very much a necessity for any modern business. Utilising technology is a key way to put yourself ahead of the competition, or at the very least keep pace with them. Your Account Manager will keep you abreast of developing workplace technology and offer recommendations that can drive your business forward. 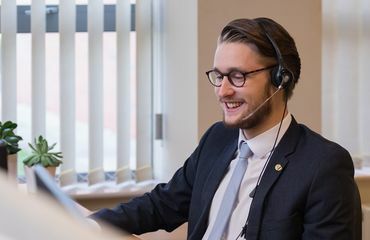 Access to our Service Team means you’re never more than a phone call or email away from expert help for issues as they arise. Timely, professional, helpful responses from our friendly team are as standard. Naturally we like to keep in touch with our customer base and so we send out regular updates full of useful information about technology and what’s going on at OGL Computer. As a responsible IT partner we also endeavour to let you know of any general issues that may arise – perhaps warnings of common security threats or hints and tips on how to keep your IT infrastructure safe and secure.